World-famous Brazilian photographer Sebastião Salgado and Vanity Fair magazine have joined forces to publicize the plight of the Awá Indians, who have been labeled ‘Earth’s most threatened tribe’ by Survival International, the global movement for tribal peoples’ rights. The 13-page feature, published in December’s magazine, is out worldwide since November 1. 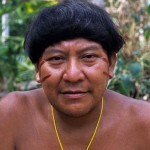 Vanity Fair’s Senior Contributing Editor Alex Shoumatoff and Salgado spent several weeks with the Awá, in the Amazon rainforest, to expose the Brazilian government’s failure over many decades to protect the tribe’s territory from a massive invasion of loggers and ranchers. 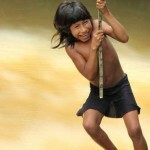 The Awá’s lands are being destroyed faster than any other Indian territory in the Amazon. The government has ignored repeated court orders to remove the loggers. 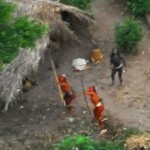 Just 450 Awá survive, of whom around 100 are uncontacted, hiding in an ever-smaller patch of rainforest to avoid the gunmen who hunt them down. A Survival International campaign, fronted by Oscar-winning actor Colin Firth, has generated more than 54,000 protest letters to Brazil’s Justice Minister. Countless celebrities, from designer Vivienne Westwood to actor Gillian Anderson, have photographed themselves with the awáIcon, a logo bearing the words ‘Brazil: Save the Awá’.